"The construction kits are plentiful and of high quality, and some even include vocals." 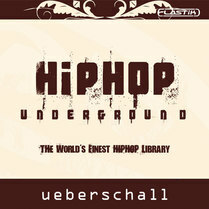 Hip Hop Underground is a selection of over 140 hip-hop construction kits, which are accessed using Ueberschall’s Elastik sample player. This comes in VST and RTAS formats as well as a standalone version, and will automatically timestretch the samples to fit your sequencer’s tempo. The instrumentation is great and sounds less synthetic than most other hip-hop collections. The construction kits are plentiful and of high quality, and some even include vocals.